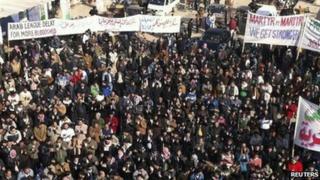 An advisory body to the Arab League has called for the organisation's observers to be withdrawn from Syria because of the ongoing crackdown on protests. The speaker of the Arab Parliament said the monitors had to leave "considering the continued killing of innocent civilians by the Syrian regime". There has been no let-up in the violence since the observers started their work on Tuesday. Their mission is to monitor a peace plan drawn up by the Arab League. The Speaker of the Arab Parliament, Salem al-Diqbassi, said in a statement that the continuing repression "in the presence of Arab monitors has roused the anger of Arab people and negates the purpose of sending a fact-finding mission". While the Arab Parliament has little direct influence over the League that set it up, these remarks about the much-vaunted observer mission in Syria clearly spell out concerns about its success. The observers are supposed to assess whether the Syrian government complies with a regional peace plan aimed at ending nine months of violence. However, since they entered the country - in lower numbers than originally anticipated - the death toll has continued to rise. There have also been other sources of controversy. There are doubts about the allegiances of the chief observer, Gen Mustafa al-Dabi, a Sudanese intelligence officer who has been connected to war crimes in Darfur. His remarks have apparently contradicted an observer shown in YouTube footage saying he had witnessed snipers in action against protesters. This all reflects badly on the credibility of the Arab League which is desperate to show that it can respond effectively to the continuing uprisings in the region and avert any possible outside intervention. "This is giving the Syrian regime an Arab cover for continuing its inhumane actions under the eyes and ears of the Arab League," Mr Diqbassi added. The parliament is an 88-member advisory committee of delegates from member states. Its recommendations are non-binding and it operates separately from the league. Correspondents say many demonstrators are becoming frustrated at the league's inability to stop the violence. About 60 monitors are in the country to verify the implementation of the Arab League plan, which calls for an end to all fighting, the withdrawal of troops from the streets and the release of political prisoners. Although some tanks have reportedly pulled back, snipers have been visible during demonstrations and rallies. The Local Co-ordination Committees, a network of anti-government groups inside Syria, said at least six people had died in various parts of Syria on Sunday. More than 150 people have been killed since the monitors arrived in the country, according to activists. The UN says puts the number of deaths in the 10-month uprising at 5,000. There has also been criticism of the head of the monitoring team, Sudanese Gen Mustafa al-Dabi - who is regarded by some as biased towards the Syrian government. On Saturday he appeared to contradict one of his officials who was quoted as saying during a visit to the southern city of Deraa that he and other monitors had seen government snipers "with our own eyes". Gen Dabi later told the BBC that the observer had made no such claim and was only speaking hypothetically. On Thursday, after a visit to the restive northern city of Homs, Gen Dabi said that "some places looked a bit of a mess but there was nothing frightening". The general has held a number of senior posts in Sudan, including in the troubled Darfur region. The government of President Bashar al-Assad says it is fighting armed groups and that 2,000 security forces personnel have died. Casualty figures and other information are hard to verify as most foreign media are barred from reporting freely in Syria.